Motion Sickness is a condition that refers to the feeling of nausea, dizziness, and vomiting, associated with travel. How is First Aid administered for Motion Sickness? Who should administer First Aid for Motion Sickness? Any individual near the person experiencing Motion Sickness (or the affected person himself/herself) may administer First Aid. 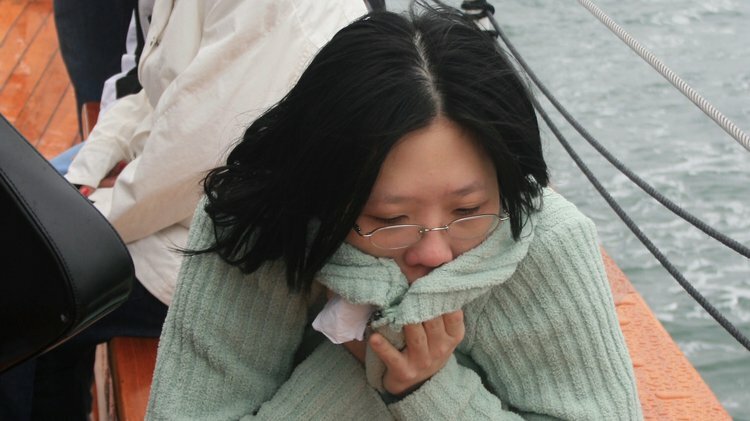 What is the Prognosis of Motion Sickness? Arshad, Q., Cerchiai, N., Goga, U., Nigmatullina, Y., Roberts, R. E., Casani, A. P., ... & Bronstein, A. M. (2015). Electrocortical therapy for motion sickness. Neurology, 85(14), 1257-1259. Golding, J. F., Paillard, A. C., Normand, H., Besnard, S., & Denise, P. (2017). Prevalence, Predictors, and Prevention of Motion Sickness in Zero-G Parabolic Flights. Aerospace medicine and human performance, 88(1), 3-9. Golding, J. F. (2016). Motion sickness. Handbook of clinical neurology, 137, 371-390. Chen, C. L., Li, P. C., Chuang, C. C., Lung, C. W., & Tang, J. S. (2016, October). Comparison of Motion Sickness-Induced Cardiorespiratory Responses between Susceptible and Non-susceptible Subjects and the Factors Associated with Symptom Severity. In Bioinformatics and Bioengineering (BIBE), 2016 IEEE 16th International Conference on (pp. 216-221). IEEE. Catanzariti, J. F., Guyot, M. A., Massot, C., Khenioui, H., Agnani, O., & Donzé, C. (2016). Evaluation of motion sickness susceptibility by motion sickness susceptibility questionnaire in adolescents with idiopathic scoliosis: a case–control study. European Spine Journal, 25(2), 438-443. Sivak, M., & Schoettle, B. (2015). Motion sickness in self-driving vehicles. Wu, T. Y., Zeng, W. J., Hsu, H. C., Kou, M. F., & Chang, C. H. (2017, June). The Effects of Moving Room Frequency on Posture Control and Motion Sickness. In Studies in Perception and Action XIV: Nineteenth International Conference on Perception and Action (p. 113). Psychology Press. Zhang, L. L., Wang, J. Q., Qi, R. R., Pan, L. L., Li, M., & Cai, Y. L. (2016). Motion sickness: current knowledge and recent advance. CNS neuroscience & therapeutics, 22(1), 15-24.